Azmoodeh-Mishamandani, A., Abdollahpoor, S., Navid, H., Moghaddam Vahed, M. (2014). Comparing of Peanut Harvesting Loss in Mechanical and Manual Methods. International Journal of Advanced Biological and Biomedical Research, 2(5), 1475-1483. Afshin Azmoodeh-Mishamandani; Shamsollah Abdollahpoor; Hossein Navid; Mohammad Moghaddam Vahed. "Comparing of Peanut Harvesting Loss in Mechanical and Manual Methods". 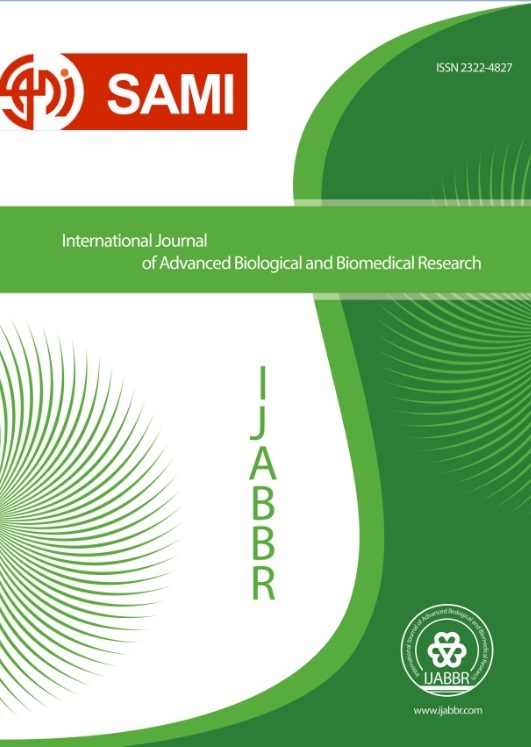 International Journal of Advanced Biological and Biomedical Research, 2, 5, 2014, 1475-1483. Azmoodeh-Mishamandani, A., Abdollahpoor, S., Navid, H., Moghaddam Vahed, M. (2014). 'Comparing of Peanut Harvesting Loss in Mechanical and Manual Methods', International Journal of Advanced Biological and Biomedical Research, 2(5), pp. 1475-1483. Azmoodeh-Mishamandani, A., Abdollahpoor, S., Navid, H., Moghaddam Vahed, M. Comparing of Peanut Harvesting Loss in Mechanical and Manual Methods. International Journal of Advanced Biological and Biomedical Research, 2014; 2(5): 1475-1483. The main purpose of this study is measuring and comparing of peanut harvesting loss in manual and mechanical methods in addition to economic analysis of them. Hence, a field was selected in Astaneh-Ashrafiyeh and divided to three different plots. Two plots were applied to measure mechanical harvesting loss and third one was applied for manual harvesting loss. According to test results, the lowest percentage of loss was belonged to forward speed of 1.8 km/ha and soil moisture content of 19.9%. The obtained data from these conditions were compared with manual harvesting data. T-test results showed all variables were significant, except percent of undug pods in 1% level of probability. The total percent of pods loss in manual and mechanical harvesting obtained 3.487 and 20.23%, respectively. The results showed the mechanical harvesting in relation with manual harvesting reduces harvesting costs and increases loss costs. Comparing of decreased and increased costs in mechanical harvesting revealed using of harvester increase overall loss and applying of it not recommended.